Enter search terms here. To go back to the full list, hit the search button with the search box empty. The poster number is shown by the first three numbers at the left of each listing (e.g., 001, 002, etc.). Posters are arranged in this order during the presentation Sunday evening from 5 – 7 PM in the Performance Hall. Click on the listing to see the abstract. 001-allen-et-al: Patient versus Clinician Focus of Care: Who’s Minding the Gap?. Diane D. Allen, PT, PhD, Carolina Talavera, MA, Stephen Baxter, PT, Kimberly Topp, PT, PhD. 002-carter-et-al: The effect of periodic intensive therapy for a stroke survivor: A Fifteen Year Case Study demonstrating the value of annual intensive therapy.. Valerie Ann Carter, PT, DPT, NCS, Kay Wing, PT, DPT, NCS, GCS. 003-cohen-et-al: The effect of different assistive devices on participation, psychosocial impact, and walking function in persons with multiple sclerosis.. Evan T Cohen, PT, MA, PhD, NCS, Donald Barone, DO, Christine Beswick, BA, CCRP, Sara Soliman, DO. 004_combs-miller-et-al: Comparison of longitudinal outcomes across the ICF between different modes of exercise for people with Parkinson disease.. Stephanie A Combs-Miller, PT, PhD, NCS, Elizabeth Moore, PhD. 005-dunning-et-al: Utilization of Aerobic Exercise in Stroke Rehabilitation: A Survey Study of U.S. Physical Therapists.. Kari Dunning, PT, PhD, Pierce Boyne, PT, DPT, NCS, Sandra Billinger, PT, PhD, FAHA, Marilyn MacKay-Lyons, PT, PhD, Brian Barney, BS. 007_fulk-et-al: Revisiting Perry’s Gait Speed Categories.. George D Fulk, PT, PhD, Kari Dunning, PT, PhD, Pierce Boyne, PT, DPT, NCS, Michael W O’Dell, MD. 008_gallardo-et-al: Recovery and Return to Work after Stroke: A Case Study of a Commercial Baker Enrolled in the Accelerated Skill Acquisition Program of the ICARE Randomized Controlled Trial.. Oscar Gabriel Gallardo, PT, DPT, NCS, Rebecca Lewthwaite, PhD, Carolee J Winstein, PT, PhD, FAPTA. 009_hays-et-al: Enhancing participation in a home based virtual reality balance program by using balance assessment scores to guide game choices in adults with TBI. Kaitlin Hays, PT, DPT, NCS, Denise O’Dell, PT, DSc, NCS, Jeffery Cuthbert, PhD, MPH, MS, OT, Candace Tefertiller, PT, DPT, ATP, NCS, Audrey Natale, PT, DPT. 010_hayward-et-al: Repetitive reaching training combined with transcranial Random Noise Stimulation in stroke survivors with chronic and severe arm paresis: A triple blind pilot RCT.. Kathryn S Hayward, PT PhD, Richard G Carson, PhD, Kathy L Ruddy, PhD, Sandra G Brauer, PT PhD, Ruth N Barker, PT PhD. 012_potter-et-al: Patient, Caregiver, and Clinician Participation to Focus the Scope of a Clinical Practice Guideline: A Paradigm Shift.. Kirsten Potter, PT, DPT, MS, Jennifer Moore, PT, DHS, NCS, Kathleen Blankshain, DPT, Sandra L Kaplan, PT, DPT, PhD, Jane E Sullivan, PT, DHS, MS.
013_pradhan: Multimodal cognitive and physical exercise for individuals with mild Parkinson disease.. Sujata Pradhan, PT, PhD. 014_shen-et-al: Adults with Cerebral Palsy: Factors Influencing Independent Living and Perceived Quality of Life.. Eunice Yu Chiu Shen, PT, PhD, DPT, PCS, Darcy Umphred, PT, PhD, FAPTA, Jane Sweeney, PT, PhD, FAPTA, PCS, Kim Nixon-Cave, PT, PhD, PCS. 015_sxirony-et-al: Outcome Measures in Subjects with Parkinson’s Disease: Determining consistent and efficient measures to be utilized in a PD specific physical therapy setting.. Kathleen B. Szirony, PT, DPT, Amy W. Chan, PT, NCS, Tracee Melaragno, SPT, Bridget C Gareau, SPT. 016_chan-et-al: Dancing and Drumming with Individuals with Parkinson’s Disease: A Community Based Program.. Amy W Chan, PT, NCS, Kathleen B Szirony, PT, DPT, Lauren Skocaj, PT, DPT, Jessica Ryan, PT, DPT. 017_timpson-et-al: Identifying Physical Therapy Activities and Treatment Trends During Acute Inpatient Rehabilitation: Results from the TBI Practice-Based Evidence Project.. Misti Lyn Timpson, PT, NCS, Cynthia L Beaulieu, PhD, ABPP, Jennifer Bogner, PhD, ABPP, Susan D Horn, PhD, Kaiwi Chung-Hoon, PT, PhD. 018_widener-et-al: Changes in Standing Stability with Balance-Based Torso-Weighting in People with Cerebellar Ataxia: a Pilot Study.. Gail L Widener, PT, PhD, Valerie Block, PT, DPTSc candidate, Cynthia Gibson-Horn, PT, Diane D Allen, PT, PhD. 019_borstad-et-al: Hemiparetic Upper Extremity Performance Improves Following Video Game Delivery of Constraint-Induced Movement Therapy.. Alexandra L Borstad, PhD, PT, NCS, Linda Lowes, PhD, PT, Lise Worthen-Chaudhari, MFA, MS, CCRC, David Maung, MS, PhD, Lynne V. Gauthier, PhD. 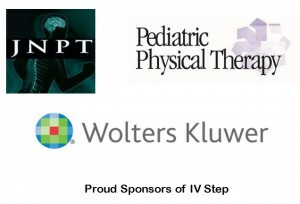 020_bjornson-et-al: Community Walking Activity in Cerebral Palsy: StepWatch & Global Positioning System (GPS).. Kristie Bjornson, PT, PhD, Philip M. Hurvitz, PhD, Cheryl I. Kerfeld, PT, PhD. 021_effgen-et-al: Changes in school participation by students with disabilities after physical therapy services.. Susan K Effgen, PT, PhD, FAPTA, Lynn M Jeffries, PT, PhD, PCS, Sarah Westcott McCoy, PT, PhD, FAPTA, Lisa Chiarello, PT, PhD, PCS, FAPTA. 022_ferro-et-al: Dancers Realize Excellence through Arts and Movement (DREAM): An inclusive dance program to promote participation in children with developmental disabilities.. Agnes McConlogue Ferro, MAPT, PCS, Lori Quinn, EdD, PT. 023_kerfeld-et-al: Measurement of Physical Activity and Participation of Children who are Wheelchair Users: Actigraph and Global Positioning System (GPS).. Cheryl I. Kerfeld, PT, PhD, Philip M. Hurvitz, PhD, Kristie Bjornson, PT, PhD. 024_laforme-fiss-et-al: Reliability and validity of a revised version of the self-care domain of the Child Engagement in Daily Life Measure.. Alyssa C LaForme Fiss, PT, PhD, PCS, Lisa A Chiarello, PT, PhD, PCS, FAPTA, Sarah Westcott McCoy, PT, PhD, FAPTA. 025_oneil-et-al: Active video games to promote physical activity in ambulatory youth with cerebral palsy.. Margaret E. O’Neil, PT, PhD, MPH, Maria Fragala-Pinkham, PT, DPT, MS, Nancy Lennon, PT, MS, Stewart G. Trost, PhD. 026_schmit: Utilizing Episodic Care to Increase Participation in Valued Activities.. Jennifer M. Angeli, PT, DPT, PhD. 027_tadvi-et-al: The Effectiveness of Task Oriented training (TOT) of on Gait function in children with spastic diaplegic cerebral palsy: A Randomised Control Trial.. Darshanaben Jashubhai Tadvi, PT, Vasanthan Rajagopalan, PT, Subramanian Durairaj, PT. 028_borchers-et-al: The Parkinson Wellness Recovery (PWR!) Gym: A Model for Delivering Early and Continuous Access to Neuroplasticity-principled Exercise Programming for Individuals with Parkinson Disease (PD).. Emily Elizabeth Borchers, PT, DPT, Becky Farley, PT, MS, PhD, Tara McIssac, PT, PhD, Amy Casady, PT, DPT, Jennifer Bazan Wiggle, PT, DPT. 029_borstad-et-al: Track-weighted functional connectivity in the sensory discrimination network correlates with haptic performance: a preliminary study in stroke.. Alexandra L Borstad, PhD, PT, NCS, Petra Schmalbrock, PhD, Deborah S Nichols-Larsen, PhD, PT. 030_brunetti-et-al: Utilization of Treadmill to Improve Gait Performance in a Patient with Late Stage Parkinson’s Disease.. Gina M Brunetti, PT, DPT, Pamela M Spigel, PT, MHA, NCS, Emily J Fox, PT, DPT, PhD, NCS, Kathryn L Doughty, PT, DPT. 031_butler-et-al: Improved upper extremity function in stroke patients using the tongue drive system and hand mentor: a preliminary study.. Andrew John Butler, Ph.D., Maysam Ghovanloo, Ph.D., David Wu, BS, Kimberly Richards, DPT, OCS, Sarah Ostadabbas, Ph.D..
032_carmona-et-al: Using Electrical Stimulation to Improve Performance of Functional Bimanual Tasks in Individuals with Moderate to Severe Stroke.. Carolina Carmona, PT, DPT, NCS, Julius P.A. Dewald, PT, PhD, Jane E Sullivan, PT, DHS, MS, Jun Yao, PhD. 033_cherry-allen-et-al: Remote limb ischemic conditioning to enhance neuroplasticity and learning.. Kendra M. Cherry-Allen, PT, DPT, PhD, Jeff M. Gidday, PhD, Jin-Moo Lee, MD, PhD, Tamara Hershey, PhD, Catherine E. Lang, PT, PhD. 034_devers-et-al: Translating Knowledge to Action: Improved patient outcomes with extra walking practice in inpatient rehabilitation. Amber Maureen Devers, PT, DPT, NCS, Pete Pidcoe, PT, DPT, PhD, Anne Chan, PT, DPT, NCS, MBA, Matt Wilks, PT, NCS, Katherine Schendt, PT, DPT. 035_devers-et-al: Connecting Knowledge Translation Strategies to Impact on Clinical Outcomes. Amber Maureen Devers, PT, DPT, NCS, Matt Wilks, PT, NCS, Melissa Banta, PT, DPT, Joana Moore, PT, DPT, Peter Pidcoe, PT, DPT, PhD. 036_field-fote_manella: Overground locomotor training modulates ankle flexor and extensor reflex activity in people with spinal cord injury.. Edelle C Field-Fote, PT, PhD, FAPTA, Kathleen J Manella, PT, PhD. 037_field-fote-et-al: Functional task practice augmented with somatosensory stimulation is superior to resistance training for improving hand strength and function in persons with tetraplegia.. Edelle Carmen Field-Fote, PT, PhD, FAPTA, Joyce Gomes-Osman, PT, PhD, Kathryn E Roach, PT, PhD, Jacqueline Tibbett, BS, Katherine Brisson, SPT. 039_frost-et-al: Investigating different interstimulus intervals of paired associative stimulation in people with chronic stroke.. Kate Frost, MS RCEP, Mo Chen, PhD, Jessica Cassidy, PhD, DPT, LeAnn Snow, MD, PhD, Teresa Kimberley, PhD, PT. 040_hayes-et-al: The Feasibility and Efficacy of a Postural Continuous Tracking Task: Exploring the Dosing of Postural Task Practice in Parkinson Disease.. Heather Anne Hayes, DPT, NCS, PhD, Sydney Y Schaefer, PhD, Leland E Dibble, PT, PhD. 042_kegelmeyer-et-al: Treadmill Walking in Individuals with Dementia with Lewy Bodies: Feasibility and Gait Effects.. Deb A Kegelmeyer, PT, DPT, MS, GCS, Jessica Stewart, student, Sandra K Kostyk, MD, PhD, Douglas W Scharre, MD, Anne D Kloos, PT, PhD, NCS. 043_kimberley-et-al: Vagus Nerve stimulation paired with Rehabilitation Improves Upper Limb Recovery after Chronic Ischemic Stroke.. Teresa J Kimberley, PhD, PT, Patricia Smith, PT, PhD, NCS, Nuray Yozbatiran, PT, PhD, Jesse Dawson, MD, Navzer Engineer, MD. 044_kimberly-et-al: The effect of combining high frequency repetitive transcranial magnetic stimulation with robot-assisted movement practice on wrist muscle activation following stroke: a case series.. Kimberly J Miller, PT, PhD, Lara A Boyd, PT, PhD, Carlo Menon, P.Eng, PhD, S. Jayne Garland, PT, PhD. 045_klassen-et-al: Practical Ways to Measure Walking Intensity During Daily Inpatient Physical Therapy in Individuals Post-Stroke.. Tara D Klassen, PT, MSc, Jennifer A Semrau, PhD, Sean P Dukelow, MD, PhD, Janice J Eng, PhD, PT/OT. 046_klatt-et-al: Short-term Outcomes for Two Individuals with Vestibular Hypofunction Following the Application of Vibrotactile Feedback during Vestibular Rehabilitation.. Brooke N. Klatt, PT, DPT, NCS, Brooke N. Klatt, PT, DPT, NCS, Tian Bao, BS, Kathleen H. Sienko, PhD, Susan L. Whitney, PT, DPT, PhD, NCS, FAPTA. 047_lester-et-al: Adaptive postural responses to vestibular illusion in individuals with parkinson disease and healthy controls.. Mark E. Lester, DPT, PhD, OCS, James Cavanaugh, PT, PhD, NCS, Scott W. Shaffer, PT, PhD, OCS, ECS, K. Bo Foreman, PT, PhD, Leland E. Dibble, PT, PhD, ATC. 048_linder-et-al: Forced Aerobic Exercise Improves Motor Outcomes in Individuals with Stroke.. Susan M Linder, PT, DPT, MHS, NCS, Anson B Rosenfeldt, DPT, MBA, NCS, Tanujit Dey, PhD, Jay L Alberts, PhD. 049_rosenfeldt-et-al: The HAAPI (Home Arm Assistance Progression Initiative) Trial: A Robotic Upper Extremity Intervention after Stroke.. Anson B Rosenfeldt, PT, DPT, MBA, NCS, Susan M Linder, PT, DPT, NCS, Komal Sahu, MPH, OTR/L, Steven L Wolf, PhD, PT, FATPA, FAHA, Jay L Alberts, PhD. 050_mccombe-waller-et-al: Task-oriented arm training in standing improves both anticipatory postural control and upper extremity functional outcomes in stroke patients.. Sandy McCombe Waller, PT, PhD, NCS, Toye Jenkins, MS, PT, Cheih-ling Yang, MS, OT, Mark W Rogers, PT, PhD. 051_prudente: Functional imaging of isometric head rotation in cervical dystonia.. Cecilia N Prudente, PT, PhD. 052_rose-patten: Does Excitatory rTMS Augment Functional Task Practice to Improve Arm Recovery Post-Stroke?. Dorian Kay Rose, PhD, PT, Carolynn Patten, PhD, PT. 053_stern-et-al: The development of learned non-use and the application of constraint-induced therapy in a patient with a musculoskeletal injury: A case report. Gail Stern, PT, PhD, NCS, Kellie Forrest, PT, Eghe Asemota, PT. 054_tefertiller-gerber: Walking-Related Outcomes for Individuals with Motor Incomplete Spinal Cord Injuries (SCIs) : 12 weeks of Step Ergometry Training in Combination with Electrical Stimulation (ES).. Candy R Tefertiller, DPT, NCS, Don Gerber, PsyD ANPP. 055_thielman-et-al: Neuroplasticity Findings for Rehabilitation of the Upper Limb Post Stroke: Comparison of MRI results to Standardized Outcomes of a Randomized Controlled Pilot Study.. Gregory Thomas Thielman, PT, EdD, ATC, Feroze Mohamed, PhD, Scott Faro, MD. 056_wamsley-et-al: High-force Haptic Rehabilitation Robot and Motor Outcomes in Chronic Stroke: A Case Study.. Carol Ann Wamsley, PT, DPT, BS, NCS, CBIS, Roshan Rai, MS, Nicholas Vivio, MS, Michelle J. Johnson, PhD. 057_siles-et-al: Promoting Knowledge Translation in Neurologic Physical Therapy through Changes to Inpatient Rehabilitation Documentation.. Amelia B Siles, DPT, NCS, Lindsay Frysinger, DPT, David Haley, DPT, NCS, Mary Hubert, PT, DPT. 058_buford-et-al: Corticospinal and Reticulospinal Cooperation for control of reaching in the normal nervous system and in a model of stroke.. John A Buford, PT, PhD, Wendy J Herbert, PT, PhD, Lynnette R Montgomery, PT, PhD. 059_faw-et-al: Defining a Novel Mouse Model of Sensorimotor Recovery After Spinal Cord Injury.. Timothy D. Faw, PT, DPT, NCS, Jessica K. Lerch, PhD, D. Michele Basso, PT, EdD. 060_argetsinger-et-al: Segmental Assessment of Trunk Control in Young Children with SCI: Responsiveness to Activity-based Therapy.. Laura Argetsinger, DPT, Shelley Trimble, PT, MacKenzie Roberts, DPT, Doug Lorenz, PhD, Andrea L Behrman, PhD, PT, FAPTA. 061_cassidy-et-al: Ipsilesional Motor-Evoked Potential Absence in Pediatric Hemiparesis Impacts Tracking Accuracy of the Less Affected Hand.. Jessica Margaret Cassidy, DPT, PhD, James Robert Carey, PT, PhD, Linda E. Krach, MD, Tim Feyma, MD, Bernadette T. Gillick, PT, MSPT, PhD. 062_duff-et-al: Contingent Reinforcement: Increasing Muscle Activation of Infants and Toddlers With Neurological Injury.. Susan V Duff, EdD, PT, OT/L, CHT, Barbara Sargent, PT, PhD, PCS, Jason J Kutch, PhD, Jamie Berggren, OTR/L, Linda Fetters, PT, PhD, FAPTA. 063_fowler-et-al: Maladaptive plasticity: effect of obligatory mirroring on knee extensor strength in spastic cerebral palsy.. Eileen Greenan Fowler, PT, PhD, Loretta Staudt, MS, PT, Marcia Greenberg, MS, PT, Kent Heberer, MS.
065_kurz-et-al: Somatosensory Cortical Activity is related to the Aberrant Motor Performance of Children with Cerebral Palsy.. Max J Kurz, PhD, Tony W Wilson, PhD, Elizabeth Heinrichs-Graham, PhD. 066_kurz-et-al: Children with Cerebral Palsy have Altered Cortical Oscillations when Planning and Executing their Motor Actions.. Max J Kurz, PhD, Amy Proskovec, MS, Jamie E Gehringer, BS, Elizabeth Heinrichs-Graham, PhD, Tony W Wilson, PhD. 067_mohn-johnsen-cope: The Impact of Dosage Parameters on Motor Function in Children with Cerebral Palsy: A Systematic Review.. Samantha Mohn-Johnsen, PT, DPT, OCS, PCS, Steven Cope, ScD, OT/L. 068_oshea-et-al: Collecting gait data in the typical clinical setting? Yes, Virginia , it can be accomplished!. Roberta OShea, PT, DPT, PhD, Nechama Karman, PT, MS, PCS, Anita Keresztury, CET. 069_peyton-msall: Constraint Induced Movement Therapy in a 4 month old infant: 2 year developmental outcomes.. Colleen Peyton, PT, DPT, PCS, Michael E Msall, MD. 070_prosser-et-al: Motor outcomes and neural correlates of asymmetrical gait training in children with acquired hemiplegia.. Laura A Prosser, PT, PhD, Sudha K Kessler, MD, MPH, Casey Gorman, BS, Heather L Atkinson, PT, NCS, Rebecca N Ichord, MD. 071_rich-et-al: Non-Surgical Brain Stimulation Studies in Children With and Without Stroke: The Child and Caregiver’s Perspective.. Tonya L Rich, MA, OTR/L, PhDs, Timothy Feyma, MD, Linda E Krach, MD, Bernadette T Gillick, PhD, MSPT, PT. 072_roberts-et-al: Outcomes of Activity-Based Locomotor Training in 3 Children with Spinal Cord Injuries Acquired before age 1 year.. MacKenzie T Roberts, DPT, Shelley A Trimble, PT, Laura C Argetsinger, DPT, Emily J Fox, PT, DPT, PhD, NCS, Sarah Suter, PT. 074_surkar-et-al: The feasibility of a sensory substitution device in improving postural control in children with balance disorders: Augmenting early brain plasticity.. Swati M Surkar, MS, PT, Regina Harbourne, PT, PhD, Max Kurz, PhD. 075_trimble-et-al: The Pediatric Neuromuscular Recovery Scale: Development, validity, and reliability of a new assessment of neuromuscular capacity.. Shelley Trimble, PT, Elizabeth M Ardolino, PhD, PT, MJ Mulcahey, PhD, OTR/L, Marci Bienkowski, DPT, Courtney Mullen, DPT. 076_beninato-tinl: Gait and Sitting Balance Scores on the Mobility Scale for Acute Stroke Predict Discharge Home.. Marianne Beninato, PT, DPT, PhD, Megan Tinl, PT, DPT, NCS. 077_bland-et-al: Predicting change during outpatient stroke rehabilitation: A retrospective regression analysis.. Marghuretta D Bland, PT, DPT, NCS, MSCI, Keith R Lohse, PhD, Catherine E Lang, PT, PhD. 078_boyd-et-al: Fine motor task function of the non-paretic hand can be predicted from a constrained motor connectome.. Lara A Boyd, PT, PhD, Sue Peters, PT, Katie P Wadden, MSc, Jason L Neva, PhD. 079_boyd-et-al: Identifying recovery potential of stroke survivors with severe upper limb disability: The need for multimodal neuroimaging.. Lara A Boyd, PT, PhD, Kathryn S Hayward, PT PhD, Julie Bernhardt, PT PhD, Katie P Wadden, MSc, Sue Peters, PT. 081_duncan-et-al: Tracking Progression of Motor Signs and Quality of Life Based on Motor Phenotype in Parkinson Disease.. Ryan P Duncan, PT, DPT, Marie E McNeely, PhD, James T Cavanaugh, PT, PhD, NCS, Lee E Dibble, PT, PhD, Terry D Ellis, PT, PhD, NCS. 082_freund-et-al: Trunk Isometric Endurance Testing Affects Postural Control in Persons with Multiple Sclerosis and Healthy Individuals.. Jane Freund, PT, DPT, MS, NCS, Deborah Stetts, PT, DPT, OCS FAAOMPT, John Magill, PT, DPT, Srikant Vallabhajosula, PhD. 083_kelley-et-al: Feasibility and efficacy of gait training in people with PD who have mild cognitive impairment.. Valerie E. Kelly, PT, PhD, Ellen L. McGough, PT, PhD, James B. Leverenz, MD, Anne Shumway-Cook, PT, PhD, FAPTA. 085_lanzino_hollman: Predicting gross motor function in persons with ALS using timed lower extremity performance.. Desiree Lanzino, PT, PhD, John Hollman, PT, PhD. 086_mcculloch-favorov: Agility Task Performance After Military Mild Traumatic Brain Injury: An Approach to Identify Subtle Motor Control Impairments.. Karen L McCulloch, PT, PhD, MS, NCS, Oleg V Favorov, PhD. 087_stephenson-et-al: Relationship between balance deficits and gait variability in adults with Friedreich’s ataxia.. Jeannie B. Stephenson, PT, PhD, NCS, Seok Hun Kim, PT, PhD, Clifton L. Gooch, MD, Kelly L. Sullivan, PhD, Theresa A. Zesiewicz, MD. 088_scheets: The Human Movement System: What’s the Big Deal?. Patricia L. Scheets, PT, MHS, DPT, NCS. 089_alfano-et-al: Validity of ACTIVE for use across ambulatory abilities in Duchenne muscular dystrophy.. Lindsay N Alfano, PT, DPT, PCS, Katherine M Berry, PT, Linda P Lowes, PT, PhD. 090_bartlett-chiarello: Difficulties in Predicting Developmental Change.. Doreen J Bartlett, PT PhD, Lisa A Chiarello, PT PhD PCS FAPTA. 091_darr-et-al: Minimal Detectable Difference and Meaningful Change for Children with Cerebral Palsy on the Pediatric Balance Scale.. Nancy Sue Darr, PT, DSc, NCS, Mary Rose Franjoine, PT, DPT, MS, PCS, Brenda Young, PhD. 092_dusing-et-al: Infants born preterm have delayed development of adaptive postural control in the first 5 months of life.. Stacey C Dusing, PhD, PT, PCS, Leroy R Thacker, PhD, James Cole Galloway, PT, PhD. 093_harbourne-berger: Magnification of variable movements help predict sitting ability in infants with neuromotor disorder.. Regina T. Harbourne, PT, PhD, PCS, Sarah Berger, PhD. 094_heathcock-et-al: A Preliminary Analysis of Spontaneous Kicking in Infants with Stroke: Do Toys Have an Impact?. Jill Heathcock, MPT, PhD, Emily Durbak, BS, Danielle Capitillo, SPT. 096_lowes-et-al: Simulated infant movements: comparing Microsoft Kinect with VICON for 3D Motion Capture.. Linda Pax Lowes, PT, PhD, Lindsay N Alfano, PT, DPT, PCS, Mike McNally, MS, CSCS, Rachel Bican, Student PT, Jill C Heathcock, MPT, PhD. 097_smith-trujillo-priego: Using full-day infant leg movement assessment to predict developmental outcomes.. Beth A Smith, PT, DPT, PhD, Ivan Trujillo-Priego, MS.
098_tedla-krishna: Reliability and Validity of Segmental Assessment of Trunk Control (SATCo) in Subjects with Spastic Quadriplegic Cerebral Palsy of Age 1 to 5 Years – A Cross Sectional Study.. Jaya Shanker Tedla, PT, PhD, Rakesh krishna, MPT. 099_barry-et-al: Will balance training improve balance performance as well as confidence in order to prevent falls in individuals with chronic acoustic neuroma? A multiple single subject pilot study.. Joni G Barry, PT, PDT, NCS, Tanya Tepen, SPT, Kristy Frey, SPT, Serena Beffa, SPT, Shannon Hasselhorst, SPT. 100_busse-et-al: Facilitating physical activity behaviour change in neurodegenerative diseases: lessons from a Huntington’s disease intervention trial.. Monica Busse, PT, PhD, Lori Quinn, PT, EdD, Rob Trubey, PhD, Nina Gobat, PhD, ENGAGE-HD Trial Management Group, Cardiff University. 101_carter-et-al: The value of physical therapist directed intensive whole body rehabilitation for patients with moderate to severe hemiparesis after stroke: a retrospective case series.. Valerie A Carter, PT, DPT, NCS, Kay Wing, PT, DPT, NCS, GCS, Kim K Gatewood, PT, DPT, NCS, Petra S Williams, PT, PhD, NCS. 102_gorman-harro: Function In Sitting Test Admission Score Predicts Inpatient Rehabilitation Discharge Destination.. Sharon L. Gorman, PT, DPTSc, GCS, Cathy C. Harro, PT, MS, NCS. 103_hendron-et-al: Mobile health technology to promote physical activity in persons with Parkinson disease.. Kathryn Hendron, PT, DPT, NCS, Terry Ellis, PhD, PT, NCS, Nancy Latham, PhD, PT, Tamara DeAngelis, PT, DPT, GCS. 104_huang-et-al: Postural parameters associated with anticipatory postural adjustments and during movement execution are altered in older adults with a history of falls.. Min Hui Huang, PT, PhD, NCS, Kelly Newman, BS, Tracy Shilling, PT, DPT, Austin Righter, BS, Kara Miller, PT, DPT. 105_johnson-et-al: Cardiorespiratory Fitness Modifies the Relationship between Cardiac Function and Cerebral Blood Flow in Older Adults.. Nathan Forrest Johnson, DPT, PhD, Brian T. Gold, PhD, Alison L. Bailey, M.D., Jody L. Clasey, PhD, David K. Powell, PhD. 106_natarajan: Responsiveness of a new mobility disability scale in community dwelling stroke patients.. Manikandan Natarajan, PT, Kumar K.B, PhD, RAJASHEKHAR B, PhD. 108_jeffries-et-al: A pilot study of change in secondary impairments in children with cerebral palsy: Are current preventative measures working?. Lynn Marie Jeffries, PT, PhD, PCS, Alyssa Fiss, PT, PhD, Doreen Bartlett, PT, PhD, Sarah Westcott McCoy, PT, PhD, FAPTA. 109_prosser-et-al: Dynamic body weight support allows toddlers with and without cerebral palsy to perform motor skills beyond their current level of function.. Laura A Prosser, PT, PhD, Karah Bush, PT, Julie Cort, PT, DPT, Meghan Tubridy, PT, DPT.